Man is the basic unit of Mankind. So it follows that he should be the epitome of the ideals that mankind stands for. How can man epitomize mankind? By spontaneously revealing the divine qualities of Love, Compassion and forbearance in perfect harmony in his thought, word and deed. In other words he should be a perfect example of his species. Any work undertaken with dedication and selflessness ie, without any expectation of reward becomes worship when it is offered to the Lord as an offering. All work is God’s work. When one belongs to God how can his work belong to another? When one discharges his responsibility with a sense of commitment to one’s own Self – the God seated in every heart that performance becomes verily God. Humanity has to be seen as a single race. Just as a beautiful garland is made up of flowers of various hues size and fragrance strung together the human race is also made up of men and women of different complexion and languages. Again, just as a garland is strung together by one thread, which is common to all flowers, the human beings also have the same Atma or life force as the core. This obviously means that a common binds all humans on the face of earth bond and therefore are brothers, east or west, black or white. This common factor called Atma has its origin in Brahma or Brahman or God. Hence, the Fatherhood of God and the Brotherhood of Man. Here hands stand for service and head for mind of the humans. Service to society is the bounden duty of everyone. And such service (Seva) has to be done selflessly, without expectation of any gain or reward. In other words, it has to be done with complete detachment. If the hands are to be engaged in Seva in a spirit of detachment and disinterestedness the mind should be completely free from desires. Freedom from desires means cultivation of Vairagya (detachment). Forest stands for Vairagya and head for the mind, which has to be cleansed of desires that cause attachment and selfishness. When the mind is thus cleansed the individual can do any amount of Seva selflessly for the welfare of society. Preaching is easy; but to practice the same is difficult. For this Bhagawan Baba refers to a Drill Master for example. While all other teachers only teach the Drill Master demonstrates also what he instructs the students. Man must put into practice what he professes himself first. Then only he has the right to advise others. 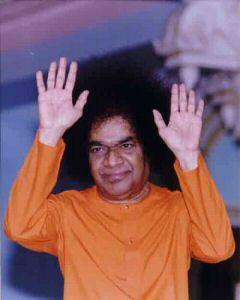 Bhagawan Baba lives every syllable of what He preaches to His devotees from daybreak to dusk. So, such an ideal life becomes a practical lesson and therefore a deep-going Message to His followers who need only remember what He does throughout the day. What is natural with the Miraculous is miracle for the ordinary. Man cannot easily identify or recognise Divinity as he is enveloped in Maya or ignorance. He has to be woken up and told of the Advent of an Avatar who has come for His upliftment. Hence just as many of us present our identity card or visiting card to a stranger the Lord has to draw our attention to the Superhuman Power of the Avatar so that we would listen to Him. It is like a call attention notice. Once the identity is established, He can convey His Message. But He has not to make any special effort for this, as what He does naturally and spontaneously will look miraculous to us. This applies both to the material and the spiritual world. One cannot be in society without mutual help and societal obligations. But very often one may not able to extend help in solving the problems of a brother or a sister because of personal limitations. In such cases one must, without losing balance, explain the position in an understanding way so that the one in need will be able to appreciate it. Such a situation often occurs while undertaking Seva activities by the Sevadal. Where discipline does not permit you to comply with somebody’s seemingly genuine request, one has to convincingly explain the position in minimum words so that the other party will feel satisfied and properly attended. Soft, short and sensible talk satisfies everyone. What is the use of spending long hours in prayers and meditation behind closed door when one’s neighbour is helplessly groaning in pain? Such prayers will certainly fail to be responded by the Lord. What is expected of a human being is to leave the prayers and rush to attend to the one in pain. It amounts to the God in you rushing to the help of the God in that person, since Manava Seva is Madhava Seva. That is how one should visualise God – the God in everyone. Wiping a tear or rendering help to alleviate the misery of a brother is much holier that reading the scriptures or repeating Vedic mantras as the former is a selfless act while the latter is a selfish one. When the knowledge acquired by reading and studying is analysed and pondered upon it develops into wisdom, granting an inner vision. The same knowledge can be converted into skill by its practical application. For example, values are understood and stored in memory as knowledge, but when applied in daily life it becomes a skill in the service to society. And the spontaneity of their application brings refinement in an individual resulting in good character, which really is the end of education. Money is known for the evanescence. It appears and disappears like a cloud. It never stays with anyone for all times. Still it can easily ensnare man in its web, as without it one cannot exist. But enamored by its glow and the comfort it offers man thinks that it has come to stay. But like passing clouds it disappears leaving its possess or still under illusion as he tries to obtain it more and more by fair or unfair means. In direct contrast is morality. Once one begins to adhere to the moral principles they permeate his life in every field of activity. Every exercise of its application gives a boost to its luster and growth with the result morality becomes ingrained in its votary as a permanent asset. This is the quintessence of the eighteen puranas authored by the great Vyasa. Every being is a spark of the Divine that accounts for the totality of this universe. Hence there is an unseen bond between human beings. So, helping another would mean helping oneself. It becomes the bounden duty of all to help each other. Conversely it is a sin to harm anyone. It amounts to harming oneself. ‘Paropakaraya Punyaya Papaya Parapeedanam’, it is said. That is, it is meritorious to help others, but it is a sin to harm anyone. Under no circumstances one should think of harming another – in thought, word and deed. Hurt is not inflicted only bodily; it can be by harsh words as well. The wound caused by words cannot be healed, as it remains etched in the mind forever. Hence, one should never hurt another even if one cannot offer any help. Only when one loves all, one can serve all, i.e., offer service without any discrimination. One who loves you is bound to be loved in return normally. But what is important and expected of us is to love the one who does not love us. This needs the awareness that there is a bond between all of us and the dislike is only superficial and momentary. All are embodiments of the same Atma and hence related inseparably. It is this awareness that underlies the urge to offer selfless service to one and all without any consideration of separateness based on any distinction. Offering help to another amounts to serving oneself. Because, by doing so one is only relieving oneself of the pain or discomfort that has afflicted him at the sight of the suffering of the other. In fact, only the body sheaths are different, the core is one and the same. Victory and defeat are the duality natural with any game and life is no exception. But as one takes it in a spirit of sportsmanship in the case of a game, in life too, the ups and downs should be welcomed with equanimity. But the possibility of victory can be worked up in the case of the game of life by selecting better and more powerful teammates. In life the fight is between the good six and the evil six. No doubt the evil six, namely, lust, anger, greed, attachment, pride, and jealousy are highly skilled ones. But, the good six, namely, truth, righteousness, peace, love, non-violence and sacrifice always have an edge over the opponents because of their inherent virtue. So, life can be steered to success provided our teammates are the good or the desirable six. These Vedic injunctions virtually provide the pillars of Indian Culture. Bharat considers mother as the first God to be revered, as she is the one whose care and sacrifice are responsible for our birth and growth. It is on the lap of the mother that one learns the alphabets and the basics of one’s conduct. It is she who teaches the child to walk and talk and the fundamentals of social life. Naturally she deserves the first place of reverence and adoration. She tells the child of its father, who, as provider of wherewithal for the family, occupies only second place in the hierarchy of veneration. The father in turn takes the child to the Guru or Preceptor who trains him in morals, ethics and the scriptures for a meaningful life. And it is the Guru who tells him about God and his relationship with the Almighty. So mother first, father next, preceptor later and God last and Ultimate - that is the order of reverence expected to be offered by everyone. Every human heart is a temple. And in the altar of the temple is seated the Lord, the source of Love Energy that sustains the individual. It is not love alone that is housed there. Compassion, patience and forbearance also find a place there. In fact, heart is the origin of these divine qualities that charge human feelings with a sense of sacrifice, prompted by which the hands go out into action of charity and help to alleviate the sufferings of our brethren. Wherever and whenever selfless service is offered a heart filled with compassion and love must be behind that service. And for the Lord seated therein their prayerful offerings are the unfading flowers of Love, Compassion, Forbearance and Sacrifice. Bhagawan Baba repeatedly tell all His devotees in general and students in particular that ‘if wealth is lost nothing is lost; if health is lost something is lost; and if character is lost everything is lost.’ Character constitutes ninety per cent of a man’s personality whether it be in the field of social life or leadership. And it is the function of Education to bring refinement in an individual making all the facets of his personality shine providing him an impressive (not only physical) personality. Wherefrom can the shine come for a good personality? It is by the harmonious blend of the five human values that lie embedded in every individual. So the purpose of education is to bring out those sterling qualities that alone can gift good character – the hallmark of true education. Swami calls this process ‘edcuare’ i.e., an education that takes care of the innate basic qualities, which are divine in content but lying hidden in an individual. And that is the most precious gift of education. ‘Example is better than Precept’ is an old adage that conveys more than what it looks to imply. While discussing pedagogy, Bhagawan Baba often mentions the example of a Drill Master who not only instructs but physically demonstrates also. If the teacher is an ideal person, fifty per cent of teaching can be presumed to have been done. The young students whose eyes and ears are wide open, observes their teacher from all angles – how he looks, how he behaves, not only in the class but even outside. This total impression makes a strong background for teaching. If the teacher maintains lofty ideals, his exhortation goes deep into the hearts and minds of the young ones. He will be adored and emulated. And, that exactly is the purpose of teaching. It is not to doll out what is written in the book that a teacher is meant for. He has to set an example before the young ones. In other words he has to be the embodiment of virtues rendering his designation meaningful. "I have come not to disturb or destroy any faith. But to confirm, each one in his own faith, so that a Christian be a better Christian; a Muslim be a better Muslim; a Hindu be a better Hindu "
In truth, you cannot understand the nature of My Reality either today, or even after a thousand years of steady austerity or ardent inquiry even if all mankind joins in that effort. But in a short time, you will become cognisant of the bliss showered by the Divine Principle, which has taken upon itself this sacred body and this sacred name. Your good fortune, which will provide you this chance, is greater than what was available for anchorites, monks, sages, saints and even personalities embodying facets of Divine Glory! Since I move about with you, eat like you, and talk with you, you are deluded into the belief that this is but an instance of common humanity. Be warned against this mistake. I am also deluding you by My singing with you, talking with you, and engaging Myself in activities with you. But any moment, My Divinity may be revealed to you; you have to be ready, prepared for the moment. Since Divinity is enveloped by humanness you must endeavor to overcome the Maya (delusion) that hides it from your eyes. This is a human form in which every Divine entity, every Divine Principle, that is to say, all the Names and Forms ascribed by man to God, are manifest! Do not allow doubt to distract you; if you only install, in the altar of your heart, steady faith in My Divinity, you can win a Vision of My Reality. Instead, if you swing like the pendulum of a clock, one moment devotion, another moment, disbelief, you can never succeed in comprehending the Truth and win that Bliss. You are very fortunate that you have a chance to experience the bliss of the vision of the sarvadhaivathwa swaruupam (the embodiment of all forms of Divinity) now, in this life itself. Let Me draw your attention to another fact. On previous occasions when God incarnated on earth, the bliss of recognising Him in the incarnation was vouchsafed only after the physical embodiment had left the world, in spite of plenty of patent evidences of His Grace. And the loyalty and devotion they commanded from men arose through fear and awe, at their superhuman powers and skills, or at their imperial and penal authority. But ponder a moment on this Sathya Sai Manifestation; in this age of rampant materialism, aggressive disbelief and irreverence, what is it that brings to It the adoration of millions from all over the world? You will be convinced that the basic reason for this is the fact that this is the Supra-worldly Divinity in Human form. Again, how fortunate you are that you can witness all the countries of the world paying homage to Bharath; you can hear adoration to Sathya Sai's Name reverberating throughout the world, even while this body is existing-not at some future date, but when it is with you, before you. And again, you can witness very soon the restoration of Sanathana Dharma to its genuine and natural status, the Dharma laid down in the Vedas for the good of all the peoples of the world. The revival of Vedic Dharma is Sai Sankalpa (Sai's Will), not just drawing people towards Me, attracting them by the manifestation of My powers and potential. This is not a phenomenon of illusion. This phenomenon is the one that will uphold truth, uproot untruth, and in that victory make all of you exult in ecstasy. This is the Sai Sankalpam (Sai's Will).